Miss Print: Blogathon Canada + a Giveaway! Blogathon Canada + a Giveaway! Hey y'all! If you've been here before - welcome back, I love you! If you're new to these parts feel free to put your feet up on my coffee table and stay a little while! Today is Ontario's turn for Blogathon Canada; that means Cathi, Cara, and myself are welcoming you to our little corner of the world! I have not had the pleasure of meeting Cara as she lives in London, Ontario, but Cathi is the extremely lovely lady who gifted me (just about three years ago now) with the sewing machine that I still use to this day. If you don't know that story, you can read more about it here. Well, let's see, I guess you'd like to know a little about me, right? 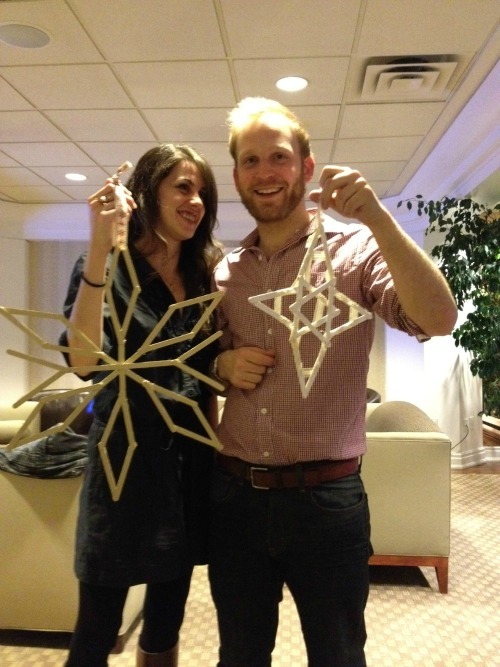 I live in downtown Toronto with my partner of four years, Alex (that's us with the popsicle stick snowflakes we made at our friends' American Thanksgiving party this past week). I am a librarian by trade, but am currently working freelance writing quilting, sewing, and cross stitch patterns, as well as articles, for various publications including Stitch Craft Create and Quilts & More. I also have my own independent line of patterns which can be found here and here. I have been crafty all me life but began quilting a few years ago when a friend from high school was getting married - I randomly decided that I wanted to make her a quilt and just jumped in fully dressed. I didn't even realize at the time that there was such a thing as a quilt pattern so I just made up my own and that's basically what I've been doing ever since. In June 2010 I was asked to take over the presidency of the Toronto Modern Quilt Guild and have been President ever since. 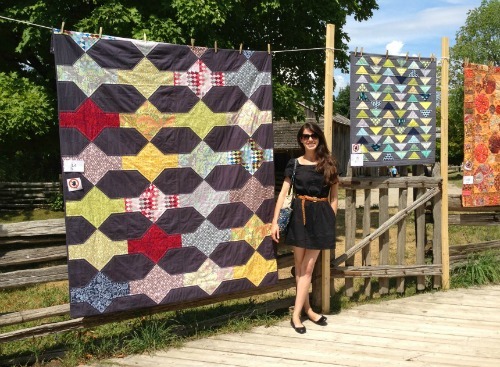 In July the TMQG was asked to participate in the Quilts at the Creek show at Black Creek Pioneer Village and this is me with two of my quilts. The one on the left is Mine Shaft and the one of the right is The Geese Have Landed. Well, how's about the giveaway now then? To celebrate the Blogathon, Sew Sisters is offering one lucky reader of my blog the chance to win the above bundle which includes one metre of the chevron print from Down Under by Mint Blossom and four coordinating Kona fat quarters in White, Deep Blue, Chartreuse, and Leprechaun. 1. Leave a comment letting know what your favourite solid colours are! 2. Leave another comment if you are a follower of my blog. That's it! Two easy-peasy ways to enter! The giveaway is only open for one day so jump on it now!! International entries are, as always, welcome! Also, please remember that I have comment moderation enabled so if you don't see your comment right away it just means that I haven't had the chance to approve it yet (duplicate comments will be deleted). really nice giveaway. I have few solid fabrics. My favorite ones are all the browns. Love the snowflakes. My current favorite solids are aqua and peach. I love purple - and the Kona solids have a lot of those. Your bundle is great - nice and bright the way I like it! Thanks for the give away! I am a follower...... I smile every time I see the picture of you hugging the bundle. I use a lot of cream, ivory and tan solids and I love blue solids. I have been stuck on Kona Cerise for a while now. I never get tired of it! Greens are always my favorite. Right now my favorite Kona color is Ash it is amazing. Hi there, I am a new follower and thrilled to have the lists of all these wonderful Canadian Bloggers to visit and some to follow. Your modern quilts are superb; I get a real kick out of art quilts and am eager to try and FINISH as many as I can. I'm finding mug-rugs are a great way to try-out new ideas in a scale that doesn't overwhelm. No matter they are always functional. My fave colour is and always have been green in any of its variances. Great blog Kaye! It's wonderful to find all this Canadian talent thanks to the Sew Sisters/Blogathon Canada. I have too many favourite colours (read: too much stash?! NOT! )but lately I've been collecting various greys. I hope you're enjoying all the Grey Cup festivities & thank you so much for a chance at the give-away! I have joined as a new follower. I am a follower! Yeah! I love white and ashgrey! I love all kinds of blues and teals. I am also a follower now! Love finding new Canadian blogs. Lately I have been sewing a lot of pinks and yellows, my favorites(I have 4 great nieces) But a new great-nephew has made me rethink, these would be perfect! Wow - your Mine croft quilt is very cool! Thank you so much for the chance to win such a great giveaway! Funnily enough, my favourite (at the moment lol) colour is chartreuse! You both made cooool Stars! Clever idea! Love 'em! Nice to meet u Kaye! Thanks for the chance to win. Love those colors especially the lime green! hi I love teal. Thanks for the chance. I use a lot of Kona Snow, but my favorite color of all is cheddar! My favorite solids are pure white, black, and red -- but I sure do love royal blue as well. I am a happy regular follower! Love that lime! Thanks for hosting. I like blue and green, just like you are giving away. Thanks so much. Kona snow is my go to - and the dark grey (don't remember the name) is another basic that makes its way into most of my sewing. Awesome giveaway! My fave Kona colors are Ash and Steel! Thanks for the giveaway! I love oranges and pinks. My favorite colours are grey and yellow! Thanks for the great give away! I love magenta, cobalt blue, and grey. I love this blog hop! I'd say my favorite color of solid is a deep blue---no baby blues, sky blues, light blues---nope, I go for the deep moody blues! Thanks for the chance to win, i would be pleased. I love blue solids and greys. i love all the greens, any shade, hue or tint! my current fav is kona's cactus. I'm loving lime these days. Fab giveaway. I'm always drawn to grays. I recently discovered cotton coutures and I LOVE how soft they are! I like the blues, but a whole lot of greys are showing up and they are tempting, too! I am a new follower and glad to be! I am indeed a follower of your blog. I like pastel solids, all this baby-pinks and blues. I love pastels, especially pink, purple and mint. Thank you for the giveaway! My favorites are greens and blues! Oh how lovely! Thanks so much! I am a follower! Your quilts look great! Love especially the flyingeese! Your quilts are beautiful! I was looking for a chevron fabric just like that a couple of days ago in NS with no luck! lol What a beautiful set! Turquoise is my fav but I adore any solid really. Just love a quilt made with solids. Your quilts are amazing! These days, I'm liking the greys. Ash and charcoal are my favourites. But, I'd love to win the ones you are giving away! I have been following for a while now. Thanks for the second chance to win. favourite solids? oranges, any shade will do. Love you blog, will come back for another visit. Nice to visit your blog, you're doing great work!! Oh, me, me, me, please! I love those colours. So nice to learn more about you, Kaye! Beautiful quilts! Thanks for the giveaway. Hi Kaye, My favourite solid colour is reddy orange, like our maple leaves in fall. What a nice photo of you and Alex- You do have a fantastic blog and I do visit when I can- The Canadian blog a thon has been terrific- I have enjoyed meeting some new to me Canadian bloggers and visiting some old friends. I love most bright colors - I do love the deep ultermarine blue- such a rich color. I love aqua, lime green and yellow, separately or together, but the solid I use the most is Ash, so I guess that is a favorite as well. I'm pretty much drawn to blues but Chartreuse is one of my absolute faves to add a little pop! I'm a sucker for the greens and greys! Thanks for the give away! And I just became a follower! my favorite color is pink. i love putting purples and turqoise with it. Beautiful giveaway! My favorite solids are teal, pumpkin, and lime green! So glad I checked back in and found your post up! I'm a big fan of navy right now, but all colour is glorious! I'm already a follower. Thanks for the giveaway! This time visitor to your blog...thanks! Love greens. Lovely! I am a follower (and thanks for mentioning my blog too -- so sweet!). I love this Blogathon! !I have discovered so many new pages and quilters!! Will also check out your patterns!! I love purples all shades with the lime green. I am also a follower for over a year and I enjoy your blog. My favorite solids are: turquoise, black and purples...thanks for the chance at your fabrics! Love your blog! I am starting a tinners exchange and have been threatening to put lime greens in my tin. These would be perfect! Thanks for the chance to have them. Well for Kona, crimson and peapod are my current faves! I do tend to aim towards any greens in general. I follow your blog too, thank you for the giveaway! My favorite solid color? Black - it goes with everything! Have a super day! Love blues. Pretty much any blues. Now that I've discovered your blog, I'm a follower. Love it. Have a super day! I am loving all shades of blue!!! Thanks for sharing in the blogathon!! I am following your blog via Google Reader!! Thanks for another chance to win this bright and cheerful bundle!! You are one creative and talented lady!! and busy I imagine, hehe. I love a bright yellow, always makes me happy. Thank you and Sew Sisters for an awesome giveaway and a chance to win. Thanks again for a chance to win. How do I pick a favourite colour when they are all so luscious. I guess that's why I spend more than I really should on fabric. 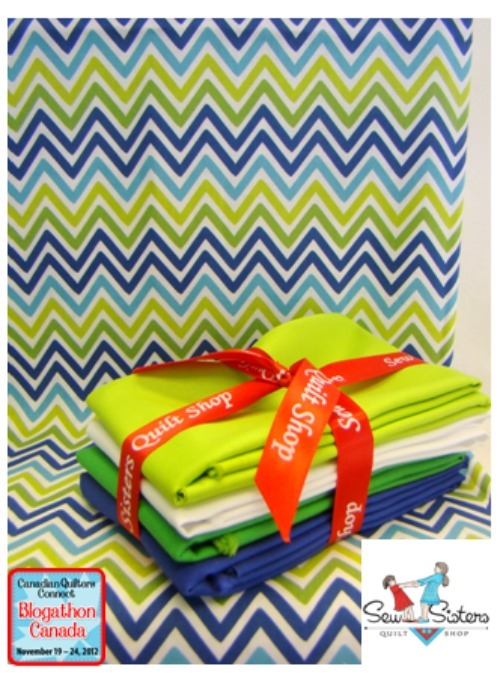 My favourite solid colours are greens and blues so if I won that fabric bundle it would be perfect! Thanks for the chance. Having no favorite single color-but many favorites, I can't choose just one favorite solid. I love pinks, oranges, reds, greens, salmons, blacks, browns. Everything pretty much but blues. I am not crazy about blue-but I like the soft aquas and teals. I can't pick a favorite Kona color. I love every single one of them! I'm a new follower. Thank you for offering a great giveaway! I look forward to seeing more of your projects. I love any shade of blue, turquoise is my favorite at the moment! Blue, blue, any shade of blue. Thanks for the chance to win. thanks for sharing some more about yourself; I really enjoy following your blog. I love any bright colour :-) I would have to say blueish purple in a solid. I love your scrappy stitched cards. How cute!!! The chevron is lovely. My favourite colours are butter yellow and then aqua. Cute picture with the snowflakes! Right now I'm liking blues, from light blue, aqua, to navy. Eek, what an awesome color combo that is!! My favorite solid color is pink. Great blog. Thanks for sharing and for the opportunity on a great draw. I love brights and darks - mainly solids with some prints for accent. Leí la historia de su maquina de coser.Me imagino su sorpresa y su felicidad. Todos los azules ,violetas ,verdes,son favoritos . Gracias por regalar tan bellas telas.Cariños. Love your quilts! And this fabric. My favourite colour is kona blue lagoon! I like to use either a white or cream but I have been changing it up a litte trying some darker colors too. Medium Grey is my favourite solid. Thanks for the lovely giveaway! I'm a follower of your blog, thanks! I love Kona's Blue Jay. Green is my favorite solid. I am a happy follower of your blog! I am a long time follower. I am a lover of Kona Chartreuse! Any blue--but Kona Pacific to be precise. I am a follower of your blog, too! Looove Kona Lagoon and Glacier! Thank you for hosting this giveaway. Good question! The color I use the most in my quilts right now is gray (all shades). I like all of them, though. Great bundle! I do love green! Greetings from Kingston, ON! I'm a follower on Google Reader! I bought some end of the bolt kona pomegranate on sale a few months ago and have been super in love ever since. My favorite colors are Kona Papaya and Azure! Your quilts are beautiful. I am a rainbow kind of gal. Thanks for the giveaway. TMQG Holiday Scrap Swap + the Giveaway Winner! Hot Air Balloons + the Giveaway Winners! Introducing Poppy + Simply Fat Quarters Giveaway!